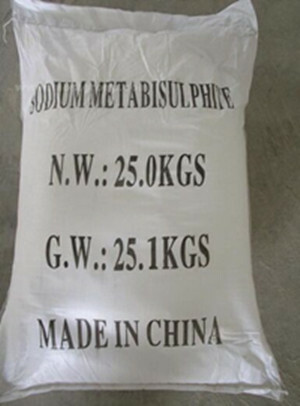 Sodium metabisulfite is white or yellow crystalline powder or small crystals.With a strong smell of the proportion of SO2, 1.4, soluble in water, an acidic aqueous solution, contact with strong acids are released SO2 and generates the corresponding salts, long in the air, is oxidized into Na2S2O6, so the product can not be stored for a long time. More than 150 degrees Celsius, which is decomposed SO2. Main uses: Dyeing mordant, dechlorinating agent for washed fabric, medical deoxidizer and sulfonating agent, bone black for bamboo, wood and paper fiber, non-ferrous mineral separation agent, waste water disposing agent, rubber coagulator. packing: external polypropylene woven bag, polyethylene plastic bag lining.